Have you ever daydreamed about impossible events? Maybe having a superpower? Or having access to a secret world that no one else can see? Humankind seems to have an innate fascination with the impossible (or improbable? ), and in no other genre than fantasy is this trend most pronounced. Authors have the ability to use any technique they wish to craft a world of their choosing, not bound by the physical laws of reality. However, this does not mean that fantasy or magical realism has no relevance to the real world! 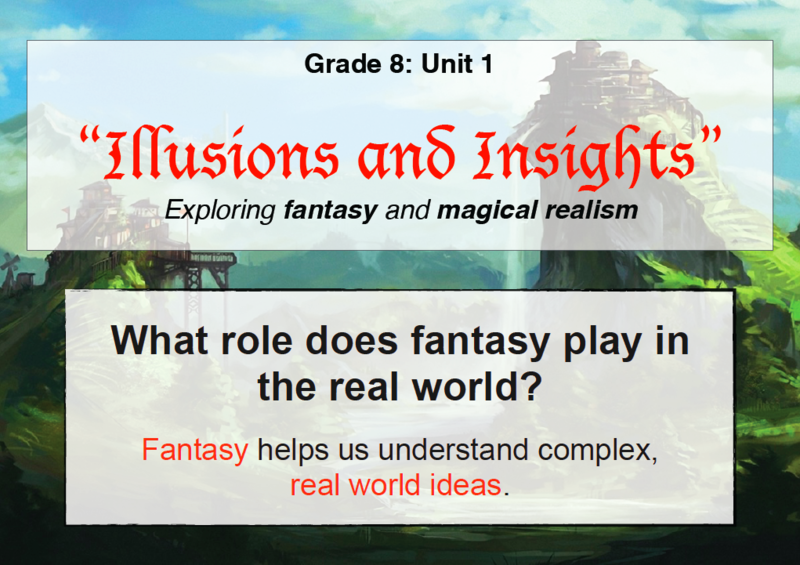 In this unit, we will examine the role that fantasy and make believe plays in our lives. We will read David Almond’s novel Skellig and examine extracts from more traditional fantasy stories as well. Focussing on the prominent themes, symbols and motifs of these fantastic stories, we will see that while they may be unrealistic, they contain ample insight hidden behind the illusion. We hope you enjoy the unit! In this introductory session, we will start getting creative! We will learn what symbolism means and then create symbolic creatures in groups. We will then base a creative writing sample on one of these fantastic creations! Today we will start by investigating the differences between two ‘fantastic’ genres – fantasy and magical realism. We will then begin reading Skellig and, applying our new knowledge, hypothesise as to what the advantages of both genres are and why David Almond might have chosen to write such a story. Setting does more than just create atmosphere – it can also be symbolic. Today we will analyse a passage, visualise the setting and discuss how imagery can be used to create both atmosphere and meaning. Literary works often make references to other people, places, things (even other literary works!). These are called allusions and they can help add to the ‘literary weight’ of a piece as well as enhance a reader’s enjoyment. Today we will research about some upcoming allusions from Skellig and make connections and predictions about the novel. Over the course of these lessons we will continue to read Skellig (as a class and individually) and hunt for literary symbols. We will interpret what they might mean and communicate our understanding in two well-written paragraphs. We focus on ‘big-picture’ thinking now that we have finished reading Skellig. We will review the novel, build vocabulary, learn to make connections between topics and discover how to find themes in literary works. We will apply everything we have learned about themes and symbols in an analysis of Skellig. After introducing the first summative assessment task, we will begin planning for our analytical essay by looking for themes and symbols in the novel. Not many people understand the difference between editing and proofreading, but it is a pretty big deal! Editing is a major step in the writing process. In this session we will learn about what editing involves and then peer and self-edit our essays. In this lesson we will read extracts from a number of fantasy stories and see how authors create symbolic characters through appearance, actions, interactions with objects / setting and imagery. Then, we will do some descriptive writing of our own about an original fantastic character. Now that we have learned how to write descriptively about a symbolic character, we need to create a visionary world for them to inhabit, as well as a biography (or background). We will read an extract from Ursula LeGuin’s A Wizard of Earthsea before doing some creative writing of our own. Now that we have learned about how the content of a story can be symbolic, let’s learn how to make the style symbolic as well! We will explore the use of figurative language in enhancing a theme and start preparing for our final creative project. We will first finish self- and peer-editing our stories before summarising our learning for the unit in a general discussion. I think the value is that, like in fairy tales, fictional books usually teach us a lesson. Dude, write more. Also, The idea of symbols and themes give us ways to look deeper into things. By the way, you got da skills. I think fantasy is helping us understand the world by making our imagination wider. If you read a fantasy book, you’ll have more chance to imagine. And my imaging more sorts of things, you’ll get a wider idea that you can use in real world and more ways to express yourself. I think fantasy is helping us understand the world by telling us symbols that represents the real life theme. It also helps our imagination grow. I think that fantasy can help us understand our world by changing our perspective and by that help us realize the subtle similarities between our world that we take for granted. I think that fantasy helps us relate problems such as wars and conflicts. A certain fantasy in the setting may represent a society or country in real life. I found out that not only settings can represent themes or situations in real life. Characters, events, anything that stands out in the novel can represent important themes. Although I was right for the fact that magical realism can connect to the real world. It was interesting to know about how direct references and allusions are used in a novel. By looking at difference between fantasy and the world we are living, we can understand our world better. For example, when you’re reading a book and you find out something that doesn’t exist in real life, you notice it and learn more about real life. Hey Jinho. Your idea is never developed, and let me explain my idea, which is developed. Basically, it means you’re bad and I’m smart. Fantasy isn’t just telling what’s not in the world by bringing up fantastic ideas. Surprisingly, it shows an aspect of the world by having symbols and themes in it. People get into the fantasy world as they read a book or watch a movie. When they find symbols or themes that connects explains a part of the world, that’s when they understand the world, by jumping over from the fantasy to reality. What is the value of fantasy in helping us understand our world? The value of fantasy is that we can learn about our world more easily and more quickly in a special way. For example, in the book ‘Percy Jackson’ it talks about a lot of structures in L.A and teaches us about what power does the god have. Before, in my old school, I learned about Greek gods, but it was really hard to remember. However, when I start reading ‘Percy Jackson’ I can remember it straight away and have more knowledge to it. Another value of fantasy is that we can grow our imagination/creativity in our real world. I think that the value of fantasy will make us learn something as a lie that makes us realize truth or at least the truth that is given us to understand. I believe fantasy allows us to see how a different world responds to certain situations, thus allowing us to compare the said situations and reactions to our own world’s and see the different ways we could have responded. In fantasy and in real life, there are major differences, but there are often small things that are the same, which helps us look at our own world differently. Like my previous answer, I believe fantasy is important because it gives us different situations to teach lessons and morals we need in real life. These lessons are taught in a way that brings out deeper thinking of the ideas, as they are not in setting we are used to. Additionally, I now know that these ideas are often represented through simple symbols which we often do not realize are symbols. Fantasy usually refers to a problem which can occur in real life. This is especially palpable in symbols. When you recognise a symbol, try to find the real life counter-part. Correlate them, find out the meaning and reason. You might find out the meaning of life inside a symbol (Not really though). That is how symbols can aid us in understanding real life. My new meaning is: Fantasy usually refers to a problem which can occur in real life. This problems are represented in themes. This is palpable when you start analysing books and start to understand the meaning. When you have a real world problem, find a symbol or theme in a book, correlate them. You could find out a lot by just recognising symbols or themes in books. This is how symbols can aid us in understanding real life. Fantasy in this world tell us and gives us imagination and gives us more ideas. It can be used for creative writing and is a important element. Fantasy will make our mind and our world bigger. I do have the same opinion as before though I developed the skill of noticing the symbols in books and movies. I also see development in each character easier and I learned that I should include lots of evidence when your writing an analysis essay. You grew a lot Totah and use your skills while reading other books. The value of fantasy in helping us understand our world is that fantasy can sometimes tell us what the world needs to improve to make a better world. Also mostly fantasy books tells us a good message for the reader. Fabulous comment. I think it would be better if you used commas to help the reader understand. This is a different way of thinking from me now however, I think it is a interesting way to interpret this question. This makes me think about different ideas which is really fascinating. Nice job me from 2months and 10 days ago. I think fantasy helps us understand our world because it makes us have bigger imaginations and also it can have morals. At the beginning of this unit, I answered that fantasy makes us have bigger imaginations and can have morals. I still think that way, but I learned more about it during this unit. I learned that fantasy has great symbols that represent themes that can be helpful in real life. I think fantasy puts a sense of imagination in our minds as we read the story it makes us dig deeper into the story as we read. It makes us wonder about the connections in the book etc. Fantasy also adds small details into stories that help us get a better idea of the main story. Fantasy Can help us in many ways in the real world. Did i answer the question correct? Im not really sure if this is what i was supost to do. If i didn’t answer correct hear is a noter thought of mine. Fantasy helps us to think in a bigger range and more creative in like art works,home works ………and more. I hope i answered it correct. This is what you will think in a month about fantasy. Although fantasy is usually based in a fictional world from the creator’s mind, the symbols in it can greatly help up understand aspects of our own world. Symbols can be everywhere in fantasy, and finding their meanings is what makes us think deeply of the real world. For example, the gold ring in “The Lord of the Rings” is the symbol of love and commitment. This could be related back to the real world, (marriage) and how we perceive it. Throughout this unit, my thinking on this unit, “What is the value of fantasy in helping us understand our world?” has developed bit by bit over time. Now, I think that fantasy is essential for helping us find the underlying themes behind the symbols, as well as in real life (if real life is that deep). If all symbols were random, they would just be representing random things for absolutely no reason. However, using some of these symbols to express a hidden message or theme is very important and fantasy helps us find these hidden themes. Overall, my mind has surpassed yours. Fantasy is helping us by showing us another “truth” another world and make us think about the differences. I think you got a point but is not only another truth, it’s showing an life lesson from a theme in the other truth as we said. According to answering the question, I think fantasy is very useful to help us understand the world because sometimes the fictions part and the real part can be almost the same such as reading stories about fiction with some mixed realism. also you can learn more ways to get your imagination wider so your ideas can spread around. sometimes its good to compare realism and fantasy books but they can be both interesting. In some fantasy stories, there are main themes or problems that come up, and we can relate these to main themes or problems that we face in the real world. There are also symbols in fantasy stories that are unrealistic, like fantasy creatures or things, that we can connect to actual people or things in real life. I think fantasy makes us use our imagination more as we read the story, it makes us think about things that might relate to real life. Fantasy uses mythical things ( made up things) and makes us think about the real world which is pretty amazing because it helps us think about the world we live in, in a more fun and enjoyable way. At the beginning of this unit I thought that Fantasy made us use our imagination more as we read the story,and it helps us think about real life. and I also think this now, but now i know more, I think that the themes and symbols help show the big picture in fantasy stories, like in Skellig it used a lot of symbolism and made us think about the real world. i think fantasy stories or fictional stories are overall important for us to think about the world. I think fantasy can help us understand the world because by reading fantasy books, our imagination will get wider. Also, fantasy books has a moral like the other books but more in a creative way because most of the stories in fantasy books are stories that are unlikely to happen in the real world. By looking at the differences between fantasy and the real world we can understand real life better in a way. By reading fantasy they can make stories unreal and cooler. There are also a lot of made up things and creatures and maybe we can relate that to something that is real. I was talking about being creative and relating unreal things to life. Fantasy can’t really ‘help’ us in life in anyway but can develop our mind. However it can teach us many things. Now I know symbols can let us understand the books and life better. I also learned there is always a main theme in a book. I think that fantasy can change the way we look at the world. We all think differently. Fantasy looks different for everyone. People have a different perspective about the world. When you mix fantasy and real life I think that it makes it a better place. Fantasy mixed with realism makes it fun. We get to think how we like. Especially about fantasy. For example there could be a TV show about a phoenix talking to us about the world. It makes a bit more enjoyable to listen. Because it’s an mythical animal that we’ve never seen before. It makes us dream, in a way. At the beginning of the unit I though that fantasy could help us more in being creative. Fantasy helps us give answers to questions that are (probably) impossible to answer. For example, we don’t know what it would be like to be wizards. But by reading ‘Harry Potter’, we can comprehend and imagine what it would be like! It helps us understand the world by going into another person’t perspective; we know what people would feel when they are in certain trouble. This is my opinion but, For me the fantasy world can help us understand the real world by giving us the understanding of the difference between reality and fiction/fantasy. By knowing this from your childhood I think it can improve how to judge things in a correct way. Now that I finished this unit my idea towards the way of fantasy helping us changed. This unit basically made me realise that by reading fantasy it can tell you morals you’ll never noticed in real life and actually help think about it and decide correctly when you face similar scene to the book in real life. I think that fantasy is very important because I think that without having fantasy, you will not understand the story. However, having fantasy will make you have more and more imagination so that your ideas or thoughts will be wider. Sometimes you might compare fantasy and realism but both are very interesting. I think that there are lessons that you can learn by reading a fantasy book. There are things that symbolize something else that exists in the real world. You could learn things that help you in your own life and maybe even learn more about the real world. I now think that both in real life and books there are certain symbols that give you a message or a theme (in a book). When reading a book you can notice many different symbols and then work out what they all mean together. When you do this you at the same time get more involved with the book, notice themes and also learn more about real life. Fantasy stories are based on the author’s imaginations, and impossible or unreal things often occur. Because the author cannot directly tell us the idea, they usually convey their message through something else. It is then important for the reader to understand the symbol, so that they can apply what they have learnt from the book into real life situations. Therefore, I think fantasy stories, play an important role in indirectly teaching us real life problems. After finishing the unit, I have learnt how magical realism is a genre used to teach readers real life problems through fantasy stories. The symbols in each fantasy books connect or link to something in our world, and it helps us see our world and problems in a different way, due to the fact that we get to see how others see it in a different world. Fantasy helps us escape from the world that we live in and enter a whole new non-mundane world, where our imagination takes us to where we want. This trip can be directed to the realistic world that we live in and help humans grow into a more knowledgeable being. As an emotional, and moral teaching tool, fantasy does a great job. The main themes and problems that show up in fantasy stories, actually coalesce with reality. But if we are to start believing in those stories, we forget about the morals and begin making a belief out of it. In this unit I have learned that themes are implied using symbols, and these symbols make up part of the problems in the stories and so it is all connected in one big fantasy story. I think fantasy is needed to face the reality because it can make you think of what is going to happen in the future and also because it can make you see things from different perspectives. By looking at things from different perspectives, you can have more opinions about things and it could help you to communicate more between people. I used to think that the concept only means how fantasy can change your perspective on the world but now, I think it also represents how fantasy can improve your thoughts on the world. From this unit, I learned how to connect symbols from the book with what is happening in the real world and with the relationships with others. I think fantasy will help us with the imagination skill(? )s, and by reading some fantasy books, this helps a lot understanding about our world. Before this, I didn’t know about the technique used in the books, but in the class, I’ve learnt more of the new things which is useful. Fantasy is merely a reflection of what authors hope the world was like, or hoped the world wasn’t like. This is how dystopian and utopian novels are created. Symbols are implanted in fantasy books to have the reader think about how they connect with reality. Fantasy plays a gigantic role in understanding our world, and these books are created in order to make our imaginations go wild, but to also understand the meaning of humanity. In fantasy, a lot of ideas for things and characters are based on those from the real world. So when you read fantasy, you’ll often make connections with things in your own life. Metaphors/symbols in fantasy allow you view things in new perspectives. The value of fantasy to help us understand our world, in my opinion, is when science is too complicated for us or for young children, fantasy would be a more kid friendly version of reality. When we become older we can understand science. Like everyone already said fantasy helps us understand real life with all of its morals. On the other hand, I also think that fantasy helps our mind be a bit more creative this can help people solve problems with their creative minds which books help a little in creating. At the beginning of the unit I though that fantasy helps us understand the real world with its morals and you can become more creative. Now I still think that but I have more to add. First of all, I think that you also learn about the real world through its themes and themes are shown through symbols, so technically you learn about the real world through symbols. Lastly, when there are facts in the book like about a person/topics(science), for example, from the book Skellig I learned about William Blake a person who writes poetry and didn’t like school at all. Fantasy can help us to understand the difference between real world and fictional world. For example, if we know something fictional, we can also learn the reality which we think exactly opposite from fantasy. I still believe fantasy can help us understand the difference between the real world and the fictional world. I learned that symbols can apply on themes and themes can connect to fantasy story. At the beginning of the unit I thought that fantasy can expand our imagination and tell the moral in a creative way. Now I think the same way as before. However, in addition, I think that by thinking about the symbols and the themes, we also can expand our thought.